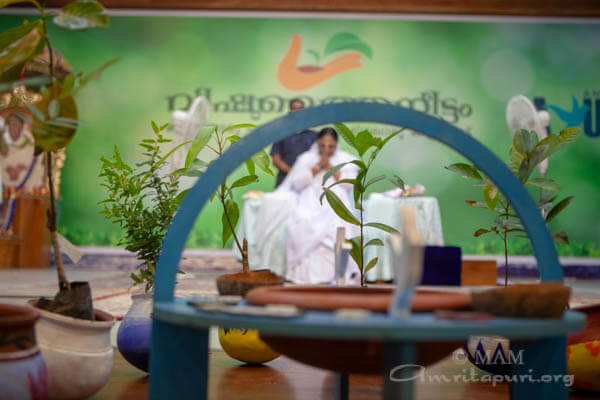 Excerpts form Amma’s Vishu message. 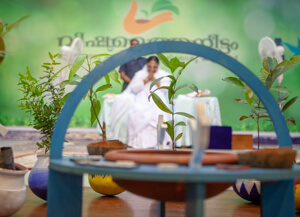 Vishu is an expression of our culture’s deep connection with Nature. 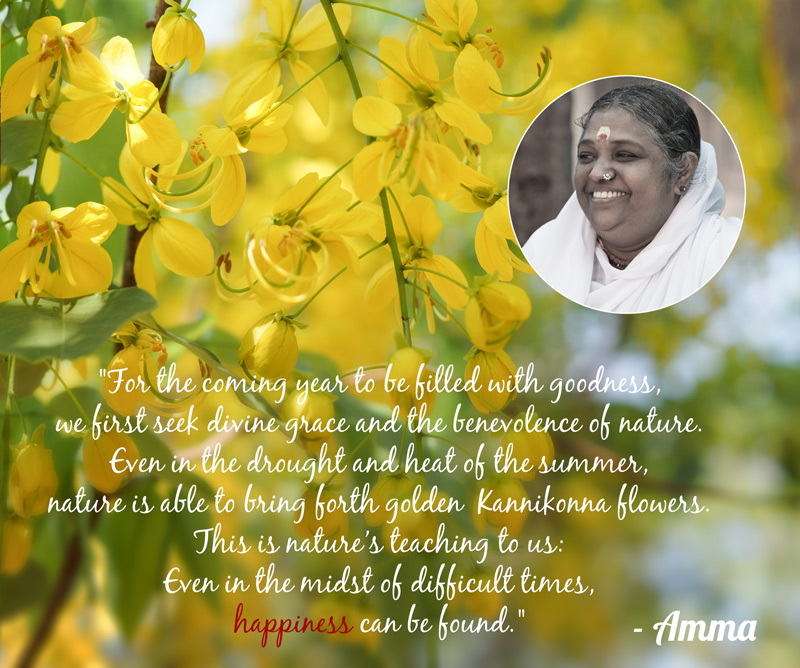 The Kani Konna flower, the Kani Vellari vegetable and all the various fruits of Vishu are not only are associated with a successful harvest, they also symbolize the love and respect our ancestors had for Nature. Sanatana Dharma teaches us that the creation and the Creator are not two but one. Nature is a visible form of God. Our birth-mother might carry us for two or three years, but Mother Earth allows us to tread on her our entire life. Our birth-mother might allow us to spit up on her during our childhood, but Mother Earth receives our waste throughout our life. She forgives our mistakes and continues to give and give. In the past, Nature was like Kamadhenu—a wish-fulfilling cow. Today, that cow has become sick and old and is stumbling towards death. We alone are responsible for this. Our indiscriminate exploitation of Nature can be likened to sawing off a tree branch on which we are seated. Along with festivity, every Vishu reminds us of our losses as well. Agriculture all but vanished from Kerala. Even the vegetables used in our Vishu decorations are imported from other states. So, love for Nature can be awoken and cultivated. Those who farm will continue farming wherever they go. Even if they stay in a small room, they will plant something in the corner. Because they have become habituated to loving Nature, the tendency to grow plants and vegetables will not leave them. Without Nature, neither human beings nor human civilization can exist. Nature is our very life’s breath. Environmental conservation is not so much part of mankind’s dharma towards Nature, as it is a part of his dharma towards himself. Why? Because without Nature, human beings cannot survive. 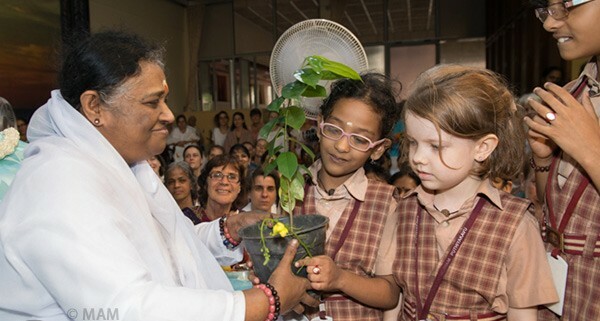 May the Paramatman bless my children so that the right attitude awakens within them. 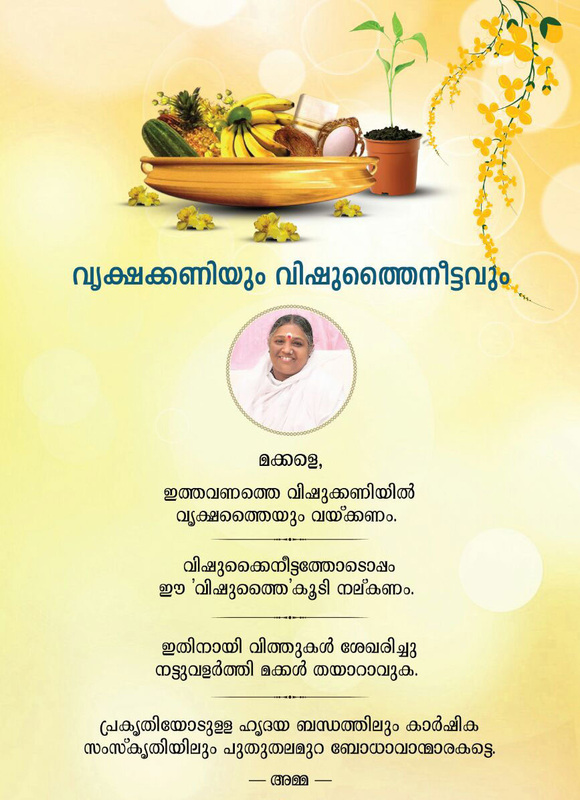 Vishu is a festival specific to Kerala and to Malayalees, and it symbolizes the age-old bond with Nature. 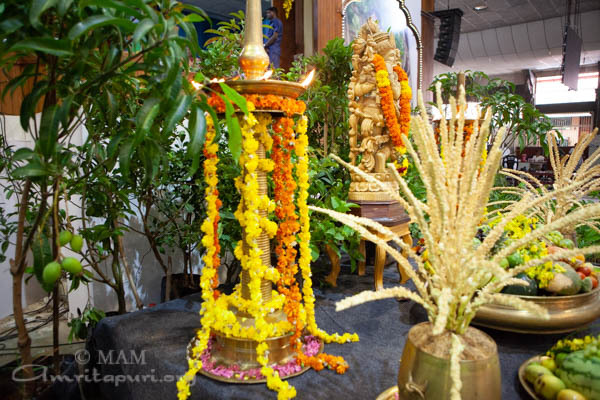 The highlights of Vishu are known as Vishukkani and Vishukkaineettam. 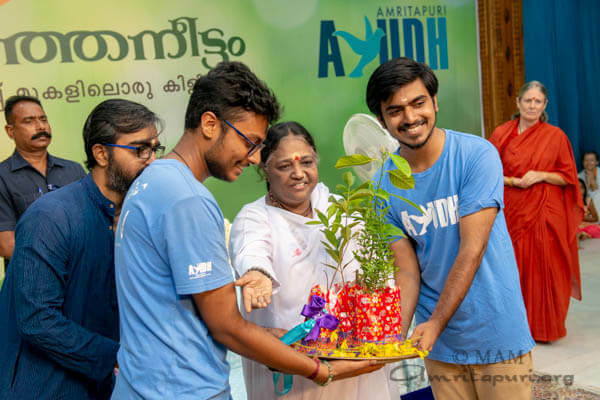 As part of this year’s upcoming festival of Vishu, Amma has launched two initiatives to help foster love for nature in the hearts of the younger generations, and to teach them to protect and preserve nature. 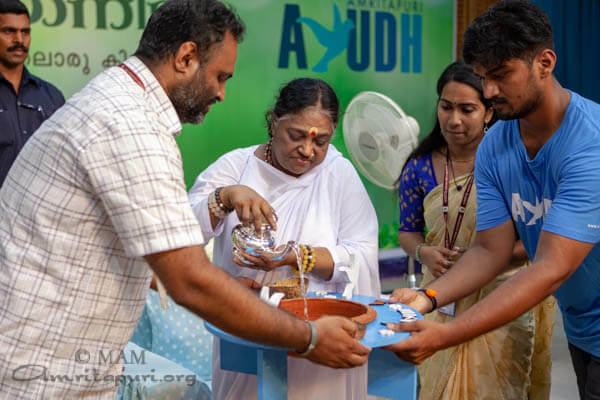 These initiatives are known as Vrukshakkani and Vishuthaineettam, as they augment the existing highlights of Vishu. Vishukkani is the first darshan (sight) the members of each household will have after waking up on the day of Vishu. 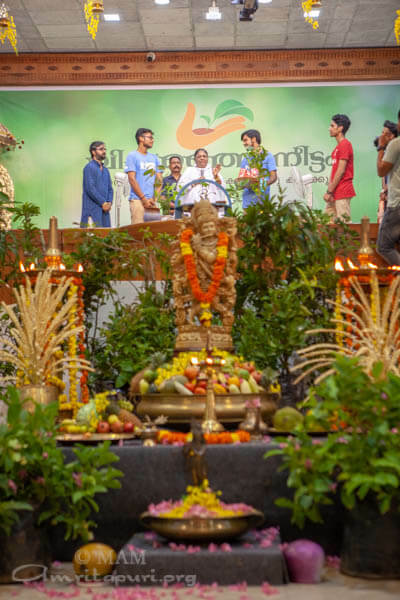 A picture of Lord Sri Krishna and an abundant display of fruits and vegetables form the main part of the Vishukkani. Traditionally, the parents blindfold the children or cover their eyes and lead them in front of the Vishukkani altar, to guarantee that this is the first thing they see on Vishu. 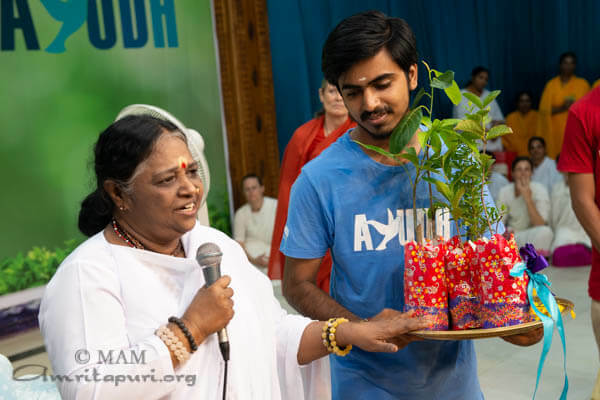 This year, Amma is asking everyone to add one more item to the Vishukkani altar: a few seedlings of any tree or vegetable—hence the name Vrukshakkani. The tradition of Vishukkaineettam is a gift, usually money, which the elders give to the young members of the family on that day. 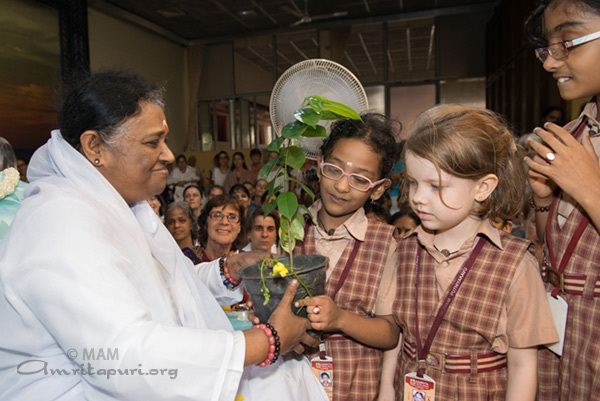 But this year, Amma is asking the elders to gift the seedlings kept in the Vishukkani to the younger ones so that they will plant it and nurture them. This will be known as Vishuthaineettam. This is a special moment in the history of Vishu. 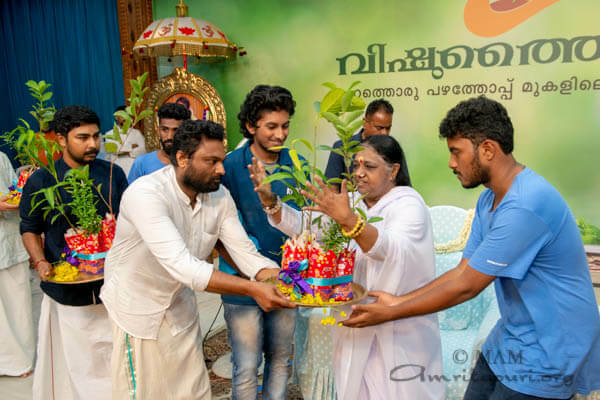 If enough people would incorporate these new traditions, it will allow the festival of Vishu to help imprint a deep bond with and love and concern for nature in the coming generations. This kind of fundamental shift in humanity’s attitude toward nature (from exploitation to loving protection) is essential in order to preserve nature’s harmony and a safe place for human beings to call home. This years Vishu falls on 15th April.